The selection of an appropriate weight reduction therapy begins with the evaluation of the patient's obesity-related health risk. Heavier patients typically have more health complications and a greater mortality, particularly if they have a large waist-to-hip ratio and hypertension, hypercholesterolaemia, or type II diabetes. 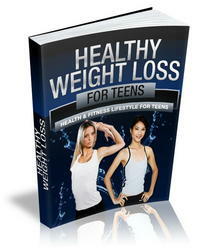 T§..b!.e..,.3 summarizes the characteristics of people with a greater or lesser need for weight loss. 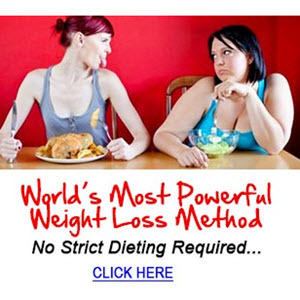 (22> Women generally have less need than men because women typically carry excess weight in their lower body. 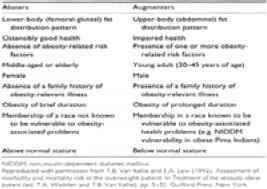 Similarly, the risks of obesity are reduced in older as compared with younger individuals. 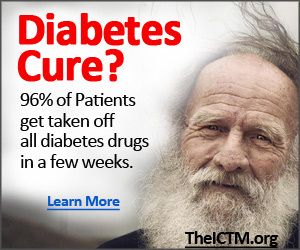 Thus, after conducting a risk appraisal, the practitioner may find him- or herself trying to ease weight preoccupation in a 60-year-old female who carries 10 extra kilograms in her hips and thighs, while exhorting a 25-year-old male with a rotund belly and family history of diabetes to take his weight more seriously. 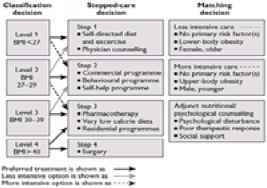 The treatment algorithm in Fig 1 shows that there are numerous options for obesity. Therapy is selected on the basis of the patient's body mass index, risk profile, and prior history of weight-reducing efforts. Generally, the more obese the patient and the greater the health complications, the more aggressive the intervention selected. Thus an individual with a body mass index over 40 kg/m2, and a history of yo-yo dieting, will probably require long-term treatment by appetite suppressant medication and, if this is ineffective, gastric surgery.